It’s nearing the end of October and we haven’t felt the need to turn on the heat yet. It’s funny because I’ve always lived in apartments where the landlord is in control and if by September 15th the heat wasn’t on, there would be hell to pay. Now that we’re in charge of our heat, we like to postpone the inevitable. It’s almost like a game – how long can we wrap ourselves in blankets and wear double sweaters before we give in? However, a chilly morning certainly can be tempered with a good bowl of oatmeal. And when that oatmeal looks and tastes like autumn, then it’s a definite win-win. I’ve heard of people putting chocolate chips or peanut butter into oatmeal and that just doesn’t sit right with me. But when someone told me that they put pumpkin into their morning oats, well, that caught my ear! After making pumpkin pie for thanksgiving, I had some pumpkin puree leftover. I swirled some into my pot of just cooked oats, along with some heady warm spices, and instantly the oatmeal took on a fall hue. A glug or two of maple syrup and I snuck a spoonful to taste – hello, autumn, you are so delicious! I topped my bowl with some of my favorite coconut yogurt and some lightly toasted pecans and my fall breakfast was ready. 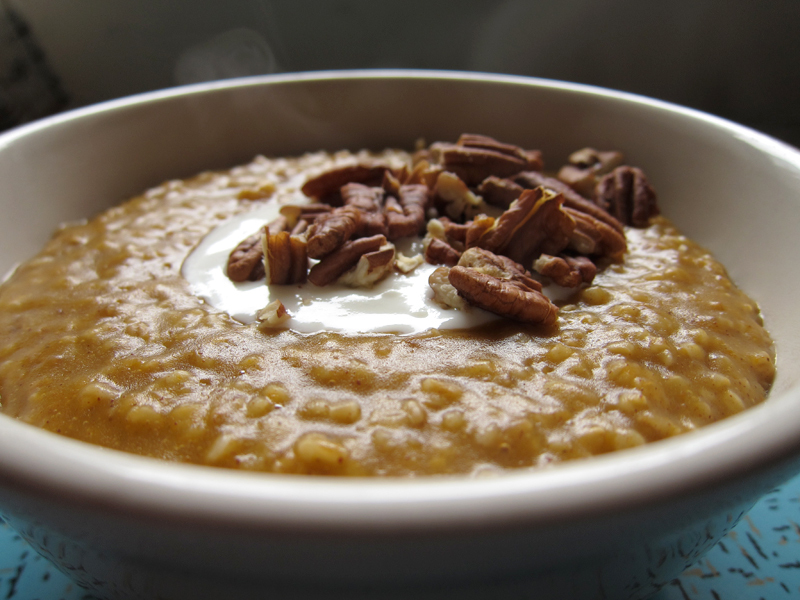 So delay your heating bill for a little while longer if you can, and get toasty and warm with these steel cut oats. This hearty breakfast will hug you like your favourite wool sweater. Elsewhere: Want to get creeped-out this Halloween? Check out my round-up of cute, terrifying and clever snack tricks and treats that exist in blog-land over at ReadyMade. In a medium pot, boil 3 cups of water. Add oats and turn down heat to a simmer, keeping the lid on. Give the mixture a stir once in a while and keep an eye on things so it doesn’t boil over. When the oats have been absorbed and are ready (about 20 minutes or so), add in the pumpkin, spices and maple syrup. Give everything a stir. Divide mixture into 2 bowls and top with yogurt and pecans, if desired. A great way to be in a good mood for the rest of the day. This looks delicious! I am ALL about pumpkin in my oatmeal. Hot tip: add an extra cup of water and throw all of this (minus garnishes) in the crockpot overnight with some dried cranberries. Breakfast is ready when you get up! Drooling. Need to try this. Yes! Another awesome way to use pumpkin puree! And I already love breakfast so much, this might put me over the edge. see now this is why i like you: you reminded me to use pumpkin in my morning oats. i never would have thought of that on my own. no one else is blogging about it either. and that’s a good, filling breakfast. so fun to see what pumpkiny things we can come up with for fall. i have oatmeal every morning actually… with coconut, blueberries and almonds. What a great way to get an easy pumpkin pie fix! My 3-year old and I LOVE the stuff! I’ll definitely try this. Oh this is an interesting combination. Love Oatmeal – a big staple in our home. Thanks! Excellent idea! My local food coop has us swimming in hokkaidos, and I’m hard pressed to use them up! Luckily they’re decorative before consumption, but I think this be next for them. I only JUST turned on my heat this week when the cold just really started to seep into my bones and even some sweaters weren’t doing it. I should have just made this oatmeal instead. Pumpkin pie for breakfast? I’m in. This is beautiful! We’ve been trying to get away from store bought cereal and eat more oatmeal and other grains (quinoa) for breakfast instead. I will definitely be making this asap! Oh please tell me where you buy coconut yogurt in Vancouver. I drive down to Bellingham for a month’s supply every time and would love to know where you buy it here. Thanks for all your inspiration! I never thought of using pumpkin with breakfast, but this looks so tasty! 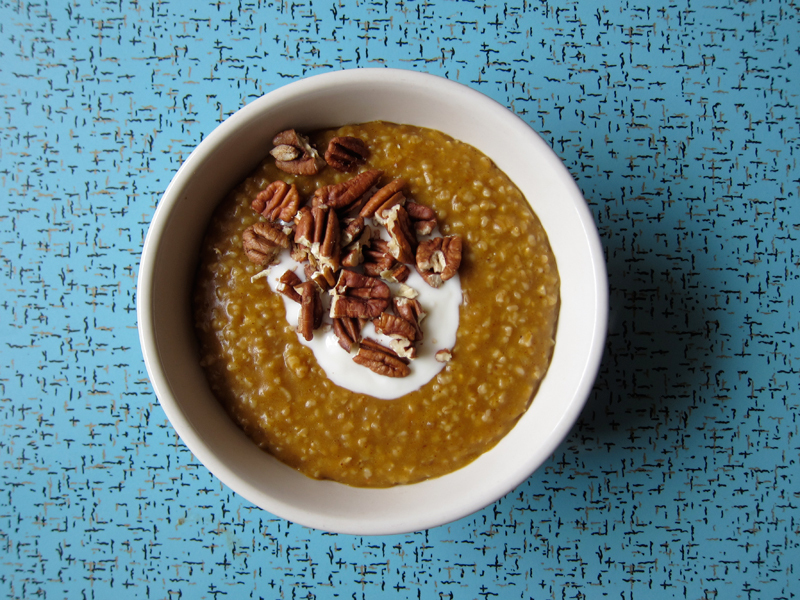 Hi Jeannette – love this idea and cannot wait to try as am huge fan of steel cut oats! I help with a porridge-based fund raiser every year – check out http://porridgeforparkinsons.com/ Let me know if you’d like to come by and try a bowl! Wow, this is simple yet genius. I had gotten so sick of oatmeal but THIS has definitely renewed my interest. Trying this for breakfast tomorrow! Nicole, definitely! This starts your day in the best possible way. Meister, try it, you’ll love it. Really, it’s super good. Vanillasugar, you are so sweet! Very filling, very tasty – it’s perfect. lyndsay, I have oatmeal often for breakfast – I’m not a super fan of blueberries. For me, it’s coconut, almonds and dried cranberries (with brown sugar, of course). Thanks Jan, you’ll love it in your house I’m sure. Jacqui, ha, you are an oatmeal adventurer! It’s still not that cold here…so far there were only 2 days where we felt the chill, Joanne. But oatmeal for breakfast always helps. Bijoux, I love oatmeal for breakfast. Give this a try. Viktoria, I find coconut yogurt most places I shop! The brand I buy is from Liberte and I can find it in my neighbourhood markets (Benny’s Market & the Union Market in Strathcona), but I’ve seen it at Granville Island Market, Santa Barbara Market on the Drive and I’m sure Choices/Capers/Whole Foods has it too. Suzanne, it’s a bit different but delicious. Foodie, it seems after I make a pie or pumpkin cookies, there’s always a bit of pumpkin leftover. This was the perfect excuse to try this breakfast. Enjoy Steph, it’s a nice change! Oh man this is an excellent idea, and perfect timing. We’ve been trying to eat oatmeal in the morning to get more protein and fiber, and mostly I’ve been making an apple/cinnamon/walnut combination. I think we might be getting a bit sick of it though, so pumpkin and pecans it is! Thanks for inspiring us by introducing a simple tweak to our routines…. I love pumpkin flavors. What a delicious way to start the morning. This sounds amazing. You’ve inspired me to roast a pumpkin, just to make this dish. Thank you! Yum! Excellent idea for leftover pumpkin puree. And I eat oatmeal practically every other morning – so i will definitely be trying this. A new way to eat pumpkin—genius! I will be making this asap. Great post. Just found your blog (searching for pumpkin spice steel cut oatmeal!) and I love it. Enjoying a bowl as I type this – thanks for posting! I just turned on my heat Sat night for the first time. Me (and my wallet) are both sad. Propane is ridiculously expensive. wow this looks amazing. good idea! Will add pumpkin to my list of add ins to my morning overnight oatmeal! Great idea. Color me impressed. I turned on the heat nearly a month ago. My shady house, so lovely in the summer months, is a nightmare when the sun is gone. So sad. 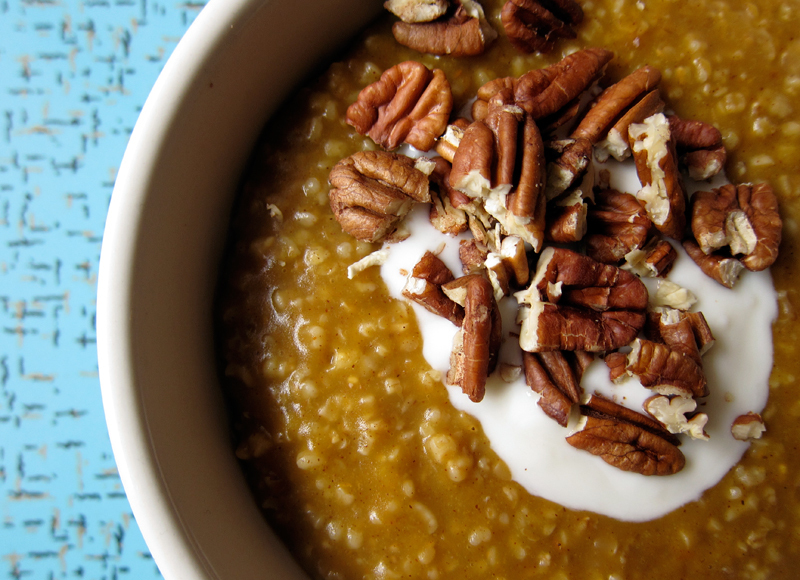 The idea of putting pumpkin in oats, however, is pure genius. I love it! Yum. Can’t think of a better way to start a fall day. So pretty to look at too! Made this and LOVE it! Blogged about it today! LadyGouda, that’s a good standard combo, but it’s good to mix things up a bit! Enjoy. Cole’s Kitch, that or use canned….that’s what I did. Julia, I hope you enjoy this. It’s delicious. Terri, so glad you discovered it. Enjoy and please browse around. RMW, I’m still heat-free over here. We’ll see how long it lasts! Eva, I’m not too much a smoothie person – but can you imagine a pumpkin pie smoothie? I think I’ll have to try that out on my smoothie-loving husband. Thanks Sues, it turned out to be a pretty nice photo. Thanks redmenace, no heat needed yet…just more pumpkin oats! Thanks tiina, it’s the perfect start. mo’betta, so glad you loved this! Oh, wow. Now THAT is the breakfast of champions. Or gourmands. Or something. Love the pumpkin concept. You can bet I’ll be riffing on this at some point this winter. Thanks for the delicious idea. Oatmeal and pumpkin were just made for each other right? I had that for breakfast this morning! Yours looks delicious! How long do you think this would last if I made a bigger batch on Sunday so I could have breakfast in the morning (in the 15 minutes before I run out the door)? You are a braver woman than me. Our heat goes on the moment there is a chill in the air. 🙂 I am one of about 12 people in the world who likes my oatmeal savory. I add nothing more than salt. But I do really like the idea of pumpkin and some spice. Sounds great. Lizzy, I think you could easily keep this in the fridge for 3 days – anything after that and I’d toss it. Ha, thanks Dana! I think I was raised by a miser so I’m used to bundling up without the heat on! Whaaaat?! Why have I never thought of this?! Sheer brilliance. I’ve literally done nothing with pumpkin yet this year…this looks like the perfect fix for the rainy weekend we’re about to have in the Bay Area. Thanks for such a great recipe! Great idea. And thanks for writing the recipe for “pumpkin puree” rather than “1/2 can of pureed pumpkin.” Could it be that pumpkin pie filling actually comes from real pumpkins?! heehee. Yay for real food. great idea! I need to just stop with the boring oatmeal already and toss in some pumpkin! i bet any winter squash would go nicely!!! Thanks Megan, I’m sure you’ll enjoy it! Heather, winter squash or yams would be ideal too! Cookie, well I’m Canadian so the pumpkin thing must be a North American thing (not just American). I will definitely try this! Love just about anything pumpkin…. Nice addition to the cold morning hot cereal routine. Yeah! Thanks Cat, it’s good to mix it up especially when there are so many cold mornings ahead! I’ve been wanting to put pumpkin my oatmeal for a while now but it means I have to open up one of those giant cans! Looks like it’ll be worth it though. I love that you put coconut yogurt on top too mmm. Just started reading your blog and I am obsessed! I just made pancakes with pumpkin puree-this is definitely next on my list!